CHICAGO, April 20, 2017 /PRNewswire/ -- CNA has kicked off its PrepWise Hail & Flood campaign to help businesses better prepare for potential property exposures that arise during spring months when flooding is more common. "Spring is a favorite season for many people, but companies that have experienced a business disruption from seasonal storms, rain, and subsequent flooding may feel otherwise," said Steve Hernandez, Senior Vice President, Commercial Risk Control for CNA. "Although flooding can happen at any time during the year, spring months are particularly prone to flooding. With proper preparation, businesses can mitigate the risks of an interruption due to spring showers, swelling rivers and accumulated melting snow and ice – wherever these weather patterns exist." 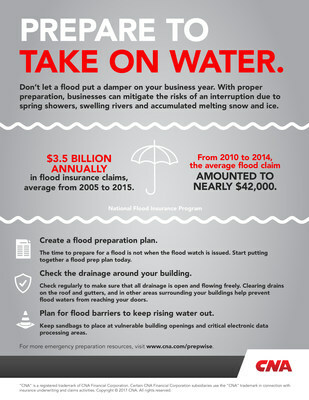 Create a flood preparation plan. The time to prepare for a flood is not when the flood watch is issued. Start putting together a flood prep plan today. Check the drainage around your building. Check regularly to make sure that all drainage is open and flowing freely. Clearing drains on the roof and gutters, and in other areas surrounding your buildings help prevent flood waters from reaching your doors. Plan for flood barriers to keep rising water out. Keep sandbags to place at vulnerable building openings and critical electronic data processing areas. In addition, CNA customers can call the company's Risk Control toll-free line at 866-262-0540, or contact their local agent to discuss these tips and more. PrepWise is CNA's preparedness campaign designed to help companies think ahead and prepare their businesses for critical exposures throughout the year. PrepWise is divided into five themes: Winter Prep, Hail & Flood, Hurricane Prep, National Prep, and Cyber Prep. Learn more at www.cna.com/prepwise.